I am designing power supply which must output following voltages at a maximum of 1.5 A stepped down from a 24 V DC supply. Waveform for one of the inputs requires following timing diagram. PWM seemed intuitively like the easiest solution as single 24 V source can be used to generate all the needed voltage levels. My trouble is finding the adequate component to do the switching. Components I found by browsing for integrated packages on the TI website so far either can't handle the voltage or switching frequency is too slow. This transistor though seems like it may be just right. Its features include voltage up to 60 V, current up to 4 A and 110 ns for single wave. Assuming I follow design below is it possible for me to obtain the voltage values I desire? 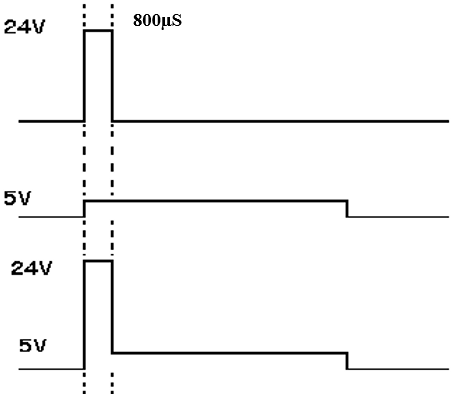 Additionally can PWM be applied in such way that 24 V signal is on for 800us and the drops to 5 V? Issue I see possibly arising is PWM being an averaged value over a period of time from where it's generated and unable to respond to quick changes such as those desired by that timing diagram. Browse other questions tagged power-supply mosfet pwm switch-mode-power-supply timing or ask your own question.